Almost two weeks after its release on the computer, Mozilla's new service is about to be released on Android. Indeed, a Firefox Send page is already available on Google Play. Firefox Send is a bit like WeTransfer but created by Mozilla. The service allows you to easily share files with other users: the file is imported on the Mozilla service and the user gets a link to share with the contacts to whom he wants to send the file. The whole system is rather well thought out and easy to use and the imported data is encrypted end-to-end to ensure its confidentiality. All that remained was to wait for the arrival of an Android version, a version that was in the company's pipes. Firefox Send Android allows, just like the web version, to share files up to 1 GB. It is possible to go up to 2.5 GB by creating a free account on the platform. Through the options, the user will then be able to choose an expiration date or a maximum number of downloads for the shared file and even protect it with a password. 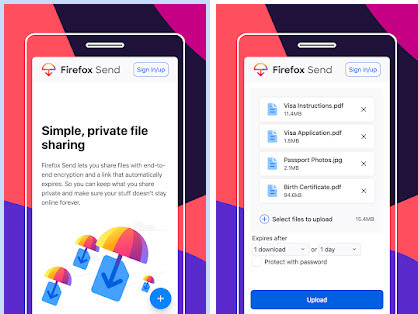 In any case, Firefox Send is a simple and convenient solution for individuals and may well overshadow other services such as WeTransfer.